Directions: 1. Coat bottom of 9×13 pan with olive oil. 2. Place all ingredients (other than Zucchini) in food processor. Pulse until mixture is crumbly. 3. Overlap zucchini in pan in rows. 4. 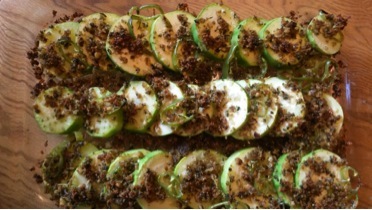 Sprinkle the bread crumb mixture over zucchini. 5. Bake for 20 minutes at 375 degrees.